Hmm yeah it looks like I have to stick with the touchbuttons now. Yeah i need an already spun ISO aswell. Windows managed to mess up my partitions and now I need a bootable usb to fix it, but I don’t have any iso. I recently copied a file from my USB harddrive which has USB 3 and the average speed was about 300 KB/s. Do anyone have USB 3 drivers for this machine? Yeah, I thought so too as mine also started to work ocassionaly when rebooted. Then it stopped working completely in both Windows and Linux no matter how many times I rebooted it. Reseating the ribbon cable actually helped, been working 100% fine now for 2 weeks since I did it. Could be worth a try at lest, takes about 10 minutes to do. I did it in Manjaro. Sadly, I can’t get a script to be run at startup. What I ended up doing was installing Redshift and making the screen a bit warmer on the “day” mode. I also had this problem. Open the laptop and remove the battery. Reseat the flat ribbon cable from the touchpad and motherboard. Have been working for a week now without problems. Wow that actually work. Now I just need to add that command as a autostart script! I opened the laptop and reseated the flat cable for the touchpad, seems to have fixed it! Sometimes when I plug in an external mouse the touchpad stops working completely both on Windows and Manjaro. I have to do serveral Cold reboots to get it working again. Anyone else having this issue? Hmm I just tried changing extension to .icc, sadly, now they can’t be opend at all. The weird thing is that the opening posts’s profile did work for me in Linux Mint, but I don’t seem to be able to get this working in Manjaro. 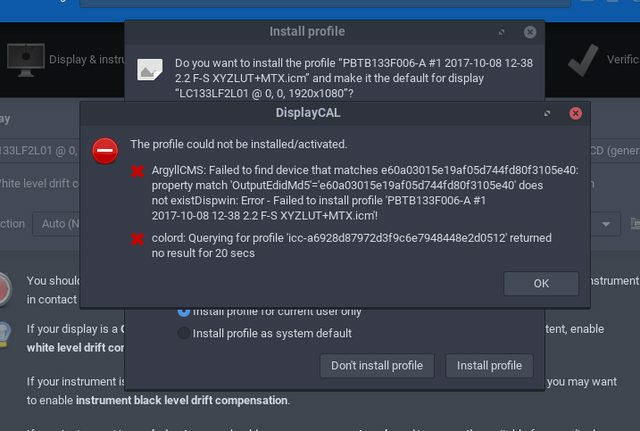 Hmm I have tried applying the profile in DisplayCal in Linux, when I try to import it I get an error message saying that the file doesn’t contain settings. I have to say, I really enjoy Manjaro. Lightweight, fast and pretty! How about Wifi? I use Manjaro 17.1.1 with XFCE. My school is part of eduroam, and the machine keeps disconnecting and reconnecting a lot and it takes serveral minutes sometimes to connect. I don’t have this problem at my home network though. On Windows 10 and Linux Mint I didn’t have this issue at school. Ok, I understand. I tried the script, but I get an error message saying only Ubuntu flavoured distros are supported I’m afraid. I needed to install Kali as we are going to do experiments at school. I can’t manage to get it installed. Is there some special boot command that I can use, just like for installing Manjaro, to get it to work? Much appreciated!